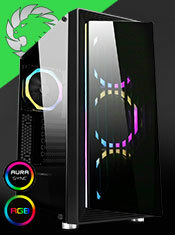 RGB Fans - Three Single-Ring Spectrum Halo fans are included on this great case to take it beyond performance. 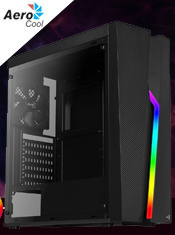 Acrylic Side Panel - The Zircon comes with a full acrylic side panel to show off the final build and all it's glory. Exceptional Cooling - The Zircon supports up to 9 fans to ensure maximum performance and significantly reduce the chance of overheating. PWM Hub & Controller - A PWM hub and controller is included the hub allows you to connect to 10 devices and having the hub included keeps your chassis interior clean and tidy. The RF remote controller makes it easier to change the colour combinations and you can light up your fans using the 50+ colour modes, you will never run out of ideas. I/O Ports - 1 x USB3.0, 2 x USB2.0 and HD audio are conveniently located on the top of the case for easy access. LED Button - An LED button on the front with the Zircon gives the user even more control on how there case looks.